In my first article about the Delphi Salaried Retirees Pension scandal, I posted an ad from Let Freedom Ring (LFR), an organization that has been shining a very bright light on this scandal and is trying to help these 20,000 retirees regain the pension they worked their entire lives for that was stolen from them by the Obama Administration through the GM/Delphi bankruptcy process. While in Washington, DC last week, I had the opportunity to sit down with LFR's executive director, Alex Cortes, to talk about this gross miscarriage of justise that was handed out by the Southern District of New York's Bankruptcy Court. I asked Cortes why LFR had picked this particular issue to use to go after the Obama Administration and Obama's re-election campaign in particular. He replied, "We're talking about this issue because the Democrats won't. At their convention, they mentioned the auto bailout over 150 times and how great it was, but not a single time did they talk about the different victims of the auto bailout." Cortes continued, "I think the Delphi non-union workers are the greatest victims of it. They had their pensions terminated by the Obama Administration, and they were subjected to pension losses of up to 70%. This was at the very same time the Obama Administration used our taxpayer dollars to bail out their union colleagues at Delphi. A lot of them worked side by side. They had been doing the same jobs for years, making similar incomes. One woke up one morning and had their pensions terminated by Obama; the other woke up one morning and had their pensions bailed out by the president." LFR is using a couple of websites to bring attention to this issue. I asked Cortes about these sites. He responded, "It's LetFreedomRingUSA.com. This particular project is on WhyMrPresidentWhy.com. So we're asking that question to him: Why would you do this? Why would you terminate their pensions unnecessarily?" "That's an important point to make as these pensions were 86% funded, the non-union pensions. That's higher than the average of the top 100 corporations in America, and he didn't terminate any of their pensions. Why would you do it to these guys?" Cortes continued. Interestingly, the Treasury Department, under Secretary Timothy Geithner, testified before the House Oversight Committee hearing on this issue that these pensions were underfunded. To this Cortes countered, "There has been two independent firms who have said that's wrong. I think what really gets to the heart of it is that it was so reckless with how it was executed. The GM Bankruptcy was one of the fastest in American history, 44 days, so I think that was honestly the root of a lot of the problem because it was so fast, they weren't really thinking of it very carefully. It's a pretty complex company, GM and Delphi, so how are you supposed to figure out all these moving parts in 44 days?" During this rush to bankruptcy, the processes that were supposed to be in place to protect everone equally were squashed. There simply was no adult supervision of the process. Cortes agreed saying, "That's where I think a lot of people just got thrown under the bus and they didn't really care because they just kind of wanted to get it over with. They have this mentality that GM is reimbursed as fast as possible, and so what if these 20,000 retirees lose their pensions. I think that's honestly what happened." 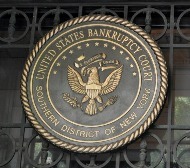 While reading BankruptcyLawReview.com, I learned this bankruptcy was carried out in the Southern District Court of New York. The courts are supposed to be watching out for all parties in the matter to make sure the process of law is followed. But the Delphi non-union pensioners were not represented in the process at all. To this Cortes said, "How is this not tried and executed in some place like Michigan where they're based. How you can do this in New York is just insane. It defies common sense. There does happen to be a lot of Delphi employees in New York, but GM is based in Detroit and so is the vast majority of the auto industry. Why are they trying this in New York with some justice who isn't very familiar with the whole issue and the community and how it functions?" The ad below from LFR shows that President Obama set out from before his election to change the bankruptcy courts as part of his plan to redistribute wealth. Clearly this was a deliberate action by the Obama Administration to carry out a previously declared plan. Cortes agreed stating, rats, "Well obviously people assume that time and time again with this president. He makes these beautiful, wonderful promises in 2008 that I agreed with that most conservatives and independents and libertarians and Democrats and the vast majority of the American public will agree with. To be the most transparent presidency in history, we saw that year how much they blocked the paperwork from coming out related to Delphi. I mean a lot of it is great promises that we can all unite around and have just been completely thrown under the bus." Cortes concluded the interview saying, "What I really like about this issue, and I think your readers will as well, is it's just not another political issue. It's easy for us all just to play politics and throw the political football, and it's hard to see how real Americans are affected because a lot of it is deep wonky policy stuff that we usually deal with, but these are 20,000 visible workers that we had on camera. I have met these people, you have spoken with them. You know these are lives that we can impact now, so it makes it that much more powerful in your role as a viewer in all of this. It can be huge." From here, I went to our nation's capitol to speak with some of the Members of Congress who are responsible for oversight of this process and who are working to try and make the Delphi salaried retirees whole in this process. A clear miscarriage of justice has taken place at the hands of the Obama Administration. What I learned last week was shocking. I will post interviews next week with Ohio Congressman Mike Turner and Indiana Congressman Dan Burton, both of whom have constituents directly affected by this biased action of the Obama Administration. Bob Price: Good afternoon, we're here in Washington, D.C. with Alex Cortes with Let Freedom Ring. I came across your group when I was doing research on this whole Delphi salary retired pension issue, and one of the ads that your organization developed to help support these people who have basically been ripped off by the Obama Administration in terms of severing non-union pensions in preference to union pensions, a very discriminatory action. I really wanted to find out what you're doing for Let Freedom Ring and why you're supporting Delphi and what the mission is. Alex Cortes: We're talking about this issue because the Democrats won't. At their convention, they mentioned the auto bailout over 150 times and how great it was, but not a single time did they talk about the different victims of the auto bailout, and I think the Delphi non-union workers are the greatest victims of it. So they had their pensions terminated by the Obama Administration, and they were subjected to pension losses of up to 70%. This was at the very same time the Obama Administration used our taxpayer dollars to bail out their union colleagues at Delphi. A lot of them worked side by side. They had been doing the same jobs for years, making similar incomes. One woke up one morning and had their pensions terminated by Obama; the other woke up one morning and had their pensions bailed out by the president. Bob Price: So these aren't the rich executive fat cats of Delphi, these are basically the engineers and skilled technicians, but they aren't in the union side, they're in the non-union salaried side. Alex Cortes: They're middle class Americans. They consider themselves so. I met with them, I went to Dayton, Ohio, and you can see a lot of them spoke on camera in our videos on how they're feeling. Most of them are retirees now. More than 20,000 retirees, mostly based in Ohio. They planned for retirement carefully. They counted on the source of income, and then it's just completely taken away by the president. They're in retirement, they're not in the labor force. How are they supposed to make up for that lost income in retirement? It's a real true injustice that people are talking about, and I think it's our moral obligation to be a voice for them what the Democrats won't be. Bob Price: I spoke with a woman from Dayton, Ohio named Patty, and she told me her story, we put it on TexasGOPVote, what she lost and what was going on with that, but it really is a shame. I found the ads, Alex, that you guys are doing to be very powerful and very effective and really taking that message out to the public. What can we in Texas, a state that will vote with the Republican side no matter what, do to help Let Freedom Ring get that message out? Alex Cortes: Well number one, share it with your friends. Most people are on Facebook and have email networks with friends across the country, so you can go to http://www.whymrpresidentwhy.com/ or on your site as well. Obviously, donate would be very helpful. The more money we can have to run these in swing states would be helpful. Texas, fortunately, is not a swing state at this point. There's other states like Ohio and Michigan, where most of the Delphi employees are actually based. This issue is highly relevant to them. We'd like to run it as much as possible in those states. Bob Price: Of these 20,000 employees that were directly effected, most of those are in that Indiana, Michigan, Ohio area right through there. Alex Cortes: Yes, there's over 5,000 in Ohio for instance and where Joe Biden's visiting this Wednesday in Dayton, there's 2,000. So they're very highly concentrated in the midwest. Alex Cortes: It's http://www.letfreedomringusa.com/ This particular project is http://www.whymrpresidentwhy.com/ So we're asking that question to him. Why would you do this? Why would you terminate their pensions, unnecessarily, that's an important point to make is these pensions were 86% funded, the non union pensions. That's higher than the average of the top 100 corporations in America, and he didn't terminate any of their pensions. Why would you do it to these guys? What's so shameful about it too is really have Democratic senators, Debbie Stabenow of Michigan and Ohio Senator Sherrod Brown, two Democrats, begging the President to restore these pensions and literally do it without a single dime of taxpayer money, you can restore their pensions because they had so much money in their pension funds, they're readily available to pay off for the next thirty or more years. There's no reason these workers shouldn't have access to it. Bob Price: Then you have the Treasury Department testified that the reason they did it was because the pension was underfunded. Alex Cortes: There has been two independent firms who have said that's wrong. I think what really gets to the heart of it is because this is so reckless with how it was executed. The GM Bankruptcy was one of the fastest in American history, 44 days, so I think that was honestly the root of a lot of the problem because it was so fast, they weren't really thinking of it very carefully. It's a pretty complex company, GM and Delphi, so how are you supposed to figure out all these moving parts in 44 days? That's where I think a lot of people just got thrown under the bus and they didn't really care because they just kind of wanted to get it over with. They have this mentality that GM is reimbursed as fast as possible, and so what if these 20,000 retirees lose their pensions, and so I think that's honestly what happened. Bob Price: The speed of this destroyed the process that's supposed to be in place to protect the average citizen. The Delphi pensioners had no representation in this process, so they were literally just thrown under the bus. The bankruptcy court, out of the southern district of New York, is basically asleep at the wheel on this because they're not looking out for the people they're supposed to be looking out for. Alex Cortes: How is this not tried and executed in some place like Michigan where they're based. How can you do this in New York is just insane. It defies common sense. There does happen to be a lot of Delphi employees in New York. GM is based in Detroit and so it the vast majority of the auto industry. Why are they trying this in New York with some justice who isn't very familiar with the whole issue and the community and how it functions. Bob Price: It's just a speed process. They just ram it through with no protection. You know, Alex, one of the things I saw that is very effective in your ad was President Obama said when he was running for president that he was going to change to bankruptcy system to stop protecting the banks and start protecting union pensions, and then he goes out and does exactly that, and we're all shocked…why's he doing that, but your ad shows that he clearly did that on purpose. Alex Cortes: Well obviously people assume that time and time again with this president. He makes these beautiful, wonderful promises in 2008 that I agreed with that most conservatives and independents and libertarians and Democrats, I mean the vast majority of the American public will agree with a lot of it. To be the most transparent presidency in history, we saw that year how much they blocked the paperwork from coming out related to Delphi. I mean a lot of it is great promises that we can all unite around and have just been completely thrown under the bus. I agree with too about pensions. These people, these retirees, plan their whole life to have it taken away while they're retired is wrong. His promise is right, if only his actions lived up to his words. Thankfully he still has time. The time to bring upon pressure is now. Considering he cares so much about his election, if we can make this a political liability for him, that's actually the greatest chance that they will want to get rid of the issue by actually restoring these pensions, so I think it's our obligation to make this an issue now, and that has the greatest likelihood of helping out these workers get these pensions back. Bob Price: That's where we need our readers to come in and take action and support Let Freedom Ring and Why Mr. President Why.com. Alex Cortes: Or to pull up your articles on Delphi that have our ads on there and share that and promote it. Bob Price: Well thank you for the work you're doing for the retirees there from Delphi and for the American people and getting this message out. Alex Cortes: What I really like about this issue, and I think your readers will as well is it's just not another political issue. It's easy for us all just to play politics and throw the political football, and it's hard to see how real Americans are affected because a lot of it is deep wonky policy stuff that we usually deal with, but these are 20,000 visible workers that we had on camera. I have met these people, you have spoken with them. You know these are lives that we can impact now, so it makes it that much more powerful in your role as a viewer in all of this. It can be huge. Bob Price: Thanks again and please keep up these ads, and we'll keep showing them to people and get the vote out in November. Alex Cortes: Thank you, that's very kind of you Bob. Appreciate it.